Every country in the world uses a standard convention for traffic lights. Red for "stop", amber / orange for "stop if you can stop safely" (though in many places this appears to be interpreted as a sign for "speed up") and green for "go". This is generally seen as a good thing. Imagine the chaos if different countries used different conventions. 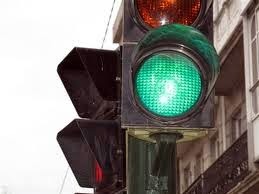 Even imply crossing a border could lead to disaster if red means go and green means stop. And add to that switching from left to right. Japan also abides by this convention. More or less. In an interesting local twist, although the light for "go" is demonstrably green, it's referred to as blue in Japanese (aoi instead of midori). The reason for this relates back to the roots of the language itself. Originally there was no differentiation in Japanese between the colours blue and green. In fact the word for green didn't come into common usage until much later than the word for blue. Hence Aoyama, the high class area of central Tokyo means "Blue Mountain" when it's a reasonable assumption that in fact the mountain was green. And it was a hill. So the reason why people refer to traffic lights as blue is simply habit. At least it was until 1973 when the government said "let's make them green but as blue as we can". I have often wondered why people in Japan called the green lights blue, this was an interesting read.